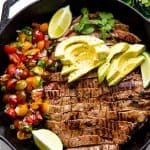 Mexican Skillet Steak is an easy dinner idea with spicy marinated steak and a quick pico de gallo. Serve it up by itself or with rice or tortillas. This is an easy weeknight dinner that packs a punch of flavor! The steak is marinated and cooked in skillet. Scoop in a quick pico de gallo and some sliced avocado and you have a complete meal. If you want to carb it up, serve it up with some rice or tortillas. What kind of steak should I use? 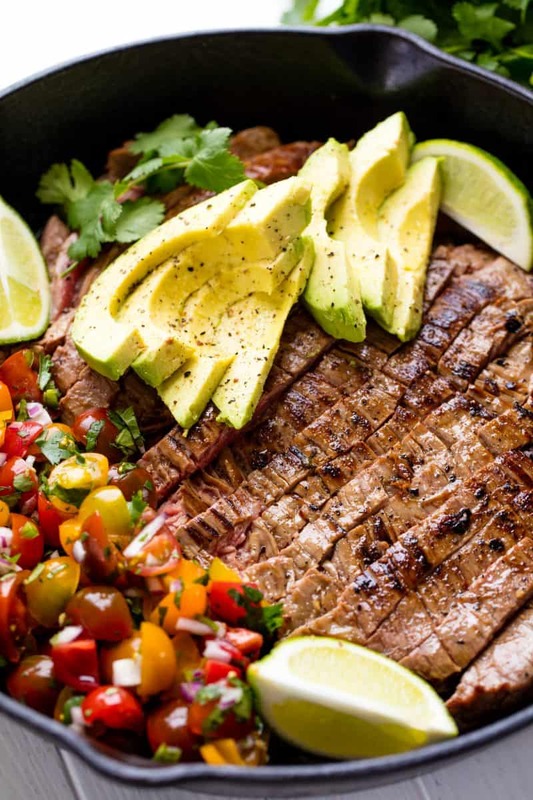 You can use flank steak, skirt steak, or a sirloin. Cooking time will vary based on how thick your steak is so watch it closely. Pico de gallo is a type of fresh salsa. It actually translates to “rooster beak” and gets its name because of how people used to eat it: by pinching it between their fingers. Sometimes it is also called salsa fresca (fresh salsa). In a small bowl, whisk together orange juice, lime juice, white vinegar, olive oil, jalapeno, garlic, salt, and pepper. Place the steak into a shallow dish. Pour the marinade over the meat. Refrigerate and let marinate for 30 to 60 minutes. Meanwhile, make the pico de gallo by combining tomatoes, onion, cilantro, jalapeno, and lime juice in a bowl. Toss together and salt to taste. Heat a large heavy skillet over high heat. Cook your steak for 4 to 5 minutes per side, or until it reaches medium-rare. Turn off the heat and let steak rest in skillet 5 minutes. Remove from skillet and slice against the grain. 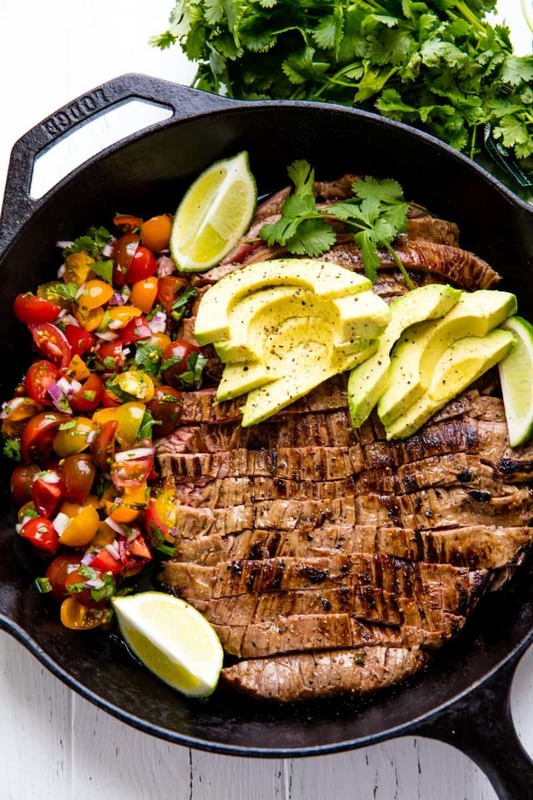 Return the steak to the skillet if desired and scoop in pico de gallo and top with sliced avocado, or serve it all separately.